If Kirk Cousins can carry the Vikings sometimes and elevates his game with special plays — which Minnesota clearly believes he's capable of doing — the Vikings have a chance to win the Super Bowl. *ESPN.com (Insider required) did its NFL QB rankings by “tiers” for the fifth year in a row. Mike Sando puts the list together with the help of voting by 50 league insiders (mainly coaches and executives), dividing the 32 projected starters into four tiers. They’re still ranked 1-32, but I like the tier system because it also differentiates between clusters of guys. Tier 1 is reserved for stars who can carry their teams. Tier 2 is for a “quarterback can carry his team sometimes, but not as consistently. He can handle pure passing situations in doses and/or possesses other dimensions that are special enough to elevate him above Tier 3. He has a hole or two in his game. And Tier 3 is is a legitimate starter, but needs a heavier running game and/or defense to win. Tier 4 is for recycled veterans and unproven rookies. After that it gets interesting and relevant to the Vikings. There’s a whole cluster of 10 quarterbacks in Tier 2, as voted on by the insiders. It has guys like Matt Ryan, Andrew Luck, Cam Newton and Matthew Stafford. But it does not have Vikings QB Kirk Cousins, who checks in at No. 15 overall as the first QB in Tier 3. Cousins is clearly being paid like at least a Tier 2 QB, and he was in that tier a year ago. 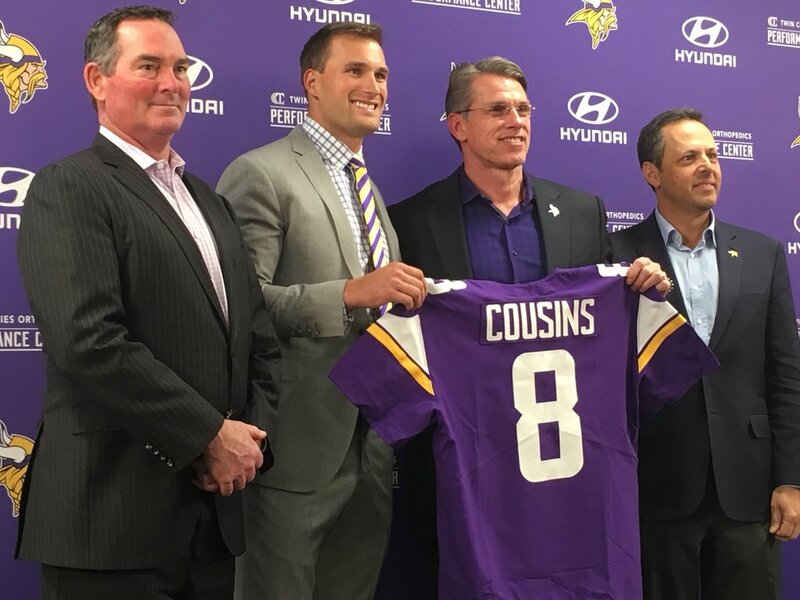 The tier system might be the best way to define what Cousins needs to be with the Vikings in order to achieve great levels of success. If Cousins can be a Tier 2 QB, carry the Vikings sometimes and elevate his game with special plays — which Minnesota clearly believes, given the talent around him, he can do — the Vikings have a chance to win the Super Bowl. A Tier 1, future Hall of Fame QB is obviously preferable, but any team with a Tier 2 QB has a quarterback good enough to win it all. If Cousins plays more like a Tier 3 QB, relying more heavily on the run game and defense without really taking over when he needs to, the Vikings can still be good. They are probably even still a playoff team. But their margin for error come playoff time is diminished, as are their Super Bowl chances. Cousins needs to be in that second tier and play something like the No. 8-12 best QB in the league instead of around 15. That will define the next three seasons for the Vikings more than anything else. *Former NFL receiver Chad Johnson — formerly Ochocinco, formerly Johnson before that — is known for being a generous tipper. He left a $260 whopper on a $140 bill, and explained on the receipt that it was because he had 260 yards in a game against the Chargers once. He also added “I love you” on the receipt, because of course he did. *Remember, kids: Always hustle. Gary Sanchez didn’t heed that advice, and it cost him dearly at the end of the Yankees’ 7-6 loss to Tampa Bay.